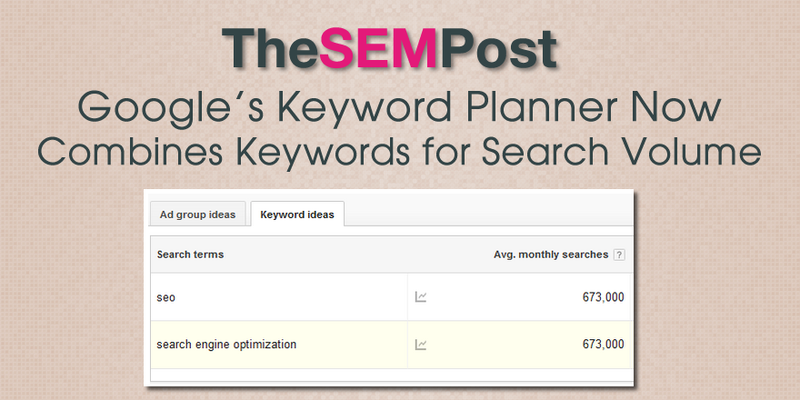 Google’s Keyword Planner has been a staple for both advertisers and SEOs to get an idea of traffic volume for keywords. This helps identify the keywords with the most traffic as well as identify keywords that have lower volume, which often means less competition. But a major changes to Google’s Keyword Planner has made those traffic volume estimates much less valuable. Last week, Google made a change to the tool where instead of showing individual keyword estimates for each keyword or keyword phrase, Google is now lumping in the data together, meaning Google will show identical estimates for similar keywords or keyword phrases – advertisers will recognize this as Google combining search variants. You can no longer see individual estimates to see which of those has the highest volume and which the lowest, and valuable aspect for both advertisers and SEOs who are choosing which keywords to target based on volume . This also has another major implication. For those that don’t notice the change – or worse, pulling the data from tools that haven’t updated to take into account the change – this means that some advertisers and SEOs are grossly overestimating those numbers, since many tools will combine data, and there is no notification alert on the results to show that how Google calculates average monthly searches has been changed. So the data could erroneously be combined, instead of noting that the estimates Google is provided are combined already for many, leading SEOs and advertisers to think search volume is far higher than it really is. For example, here are the results for two keywords – SEO and search engine optimization. Instead of reporting individually, they are now showing identical data, even though previously it showed the data individually. For someone not paying attention, they could believe that these two individually have a search volume of 1,346,000 average monthly searches total. But in reality, it is SEO and search engine optimization TOGETHER that have 673,000 monthly searches. However, there is even more problems. There could also be ADDITIONAL keywords that are included in that 673,000 figure, but the Keyword Planner does not state this. So estimates could be significantly off for someone thinking the total search volume just for “search engine optimization” keyword alone is 673,000 per month. In some ways, it does make sense that Google is showing close variants with the same data. But for some advertisers and SEOs, sometimes those close variants can have vastly different “real world” results, even if Google is now lumping them together. This change could be connected to the fact Google also began restricting access to the Keyword Planner tool to those with active AdWords campaigns only, a decision they later seemed to backtrack on, changing the “requirement” to a “bug”. And with Google using close variants in AdWords, then perhaps this change makes sense. But for those who use it as a keyword volume tool, the value of this tool just diminished significantly. I find this very frustrating, and along the same lines of moving organic search keywords in Analytics under the “(not provided)” label. Just another step towards providing less and less data. Having worked in for a Pool Table retailer, I know that the difference between the keyword “pool table” and “pool tables” is monumental The intent is drastic when you add the “s”. Now I can’t separate that data. I guess I can understand why Google would do this, I just wish they would leave the functionality available for those who would prefer to get more granular. I am not the first one who noticed this before all but I raised this in Google Forum here 3 days ago. Keyword Planner is a must tool if anyone is even thinking about Google and I wonder no one from Google responding for this issue. I used this tool every day to help Etsy shop owners. i was working on a Etsy project and noticed the difference. I had downloaded from the Ad groups and put in a bid. When I went to highlight keywords in the CSV file, I noticed some differences. I decided to download directly from the keyword ideas. Funny thing, I got the different results for the exact same keywords. When I called Google Support, they told me that the download from the Ad Group was exact matches because that what it said at the header. It also says that when I download from the Keyword Ideas seed keywords. I also know that when I go back to previous CSV files, it says exact search matches only. I know it was a broad match search. So go figure, I’m going to do it both way again and see if the numbers are the same. I did call Google support again, and they tried to tell me it was always this way even when I tried to tell them that I knew differently.